The Roissypôle bus station is located between Terminal 2 and Terminal 3 at the Charles de Gaulle airport near hotels, the RER B station and parking lots. The main French and European bus companies that stop at the RER train station/Roissypole – are Eurolines, Isilines, Ouibus and Flixbus. From the TGV - Aeroport Charles de Gaulle 2 station, close to Terminal 2, take the free shuttle CDGVAL to get to the bus station in just a few minutes. Check out our Access page, transport and parking at Roissy CDG. See the general map for parking lots, terminals and Roissy CDG. Parking P3 Resa: on reservation only, reduction rates after 6 days. 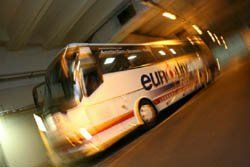 Where to take Ouibus at CDG airport? OuiBus (French bus lowcost - SNCF) is located at station platform A5 – Roissypole – Terminal 3. You can buy your ticket on the Ouibus website or on site - ticket office Roissypole-Keolis – rue de Luxembourg (near Terminal 3). Eurolines proposes trips around France and abroad. Departure at platform A3 (Terminal 3). During November 2015 a new offer - FLIXBUS - to Normandy has been set up in the bus station at Roissy CDG. This low-cost route allows you to get to le Havre, Rouen or Dieppe. To go to Park Asterix from Airport Roissy CDG you can take a direct and paid shuttle which runs during the opening days of the park. You can take it from 9 a.m. to 6:30 p.m., frequency is about every 30 minutes. At the RER ticket office you can buy your tickets for the shuttle. Information +33 01 48 62 38 33. Transfer between Airport Roissy Charles de Gaulle to Disney Park is possible via the VEA shuttle which proposes a paid bus service between the airport and the Disneyland Park hotels. It runs everyday from 9 a.m. to 8:50 p.m. from the airport to Disney and between 6:30 a.m. to 7 p.m. from Disney to Roissy. Buses “Disney Magical Shuttle” are parked at platform Terminal 2F – (door 8). You can take this bus at the RER B train station – “Aeroport Charles de Gaulle 2 – TGV” and cross through the different zones of terminal 2 which will take you to shuttle departures T2F. From the bus station, Terminal T1 and T3 take the free shuttle CDGVAL to T2F. Go to the arrivals level and go to door 8. To reserve a hotel situated near the airport zone of Paris CDG, consult the list of hotels in Roissy-Tremblay in France or apartment hotel, city apartments in Roissy, Villepinte. A shuttle will take you Aeroville shopping mall to allow you to shop or to go to the movie theater.